Unmanned Underwater Vehicles (UUVs) are part of the unmanned maritime systems (UMS) market. Although such systems have been in use for decades, global security, technological developments and new concepts of operations have been driving the market’s expansion. UUVs have been an integral part of many naval forces’ operations. They have been widely used in Mine Counter-Measures missions but it has only been a few years since certain countries envision their use as part of a wider system that also includes the use of USVs. Nevertheless, there are technological developments, in the fields of autonomy, batteries and power management, underwater telecommunications, underwater charging, sensors, and most importantly in Artificial Intelligence that will boost this market. The current global security environment poses many challenges both in the form of asymmetric threats and confrontations between peers. Having the need to field disruptive technologies the soonest possible and take staff out of harm’s way, naval forces have the ideal toolset in the form of UUVs. With most of the Earth’s surface covered by water, with around 40% of the population living near coastlines, with many energy resources found in the sea and with shipping being the arteries of global commerce, the UUV market is a promising one indeed. Recognizing the potential of the market and the R&D funds being invested for new systems and technologies, large defense contractors are positioning themselves through the acquisition of smaller companies. With all the consolidation activity taking place, there are business opportunities for all sizes of businesses. 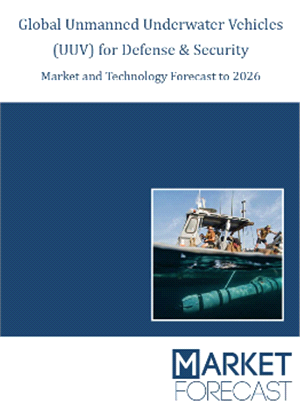 Market Forecast provides a detailed analysis of the military Unmanned Underwater Vehicles (UUV) market in the years 2018 through to 2025 in terms of in service systems and requirements per country, development programs, products available, leading companies and opportunities for manufacturers. The global UUV market is valued at US$ 9.4 billion to 2025, with a CAGR of 7.4% over the forecasted period. Snapshot on global security issues, defense budgets, spending patterns and how these affect the procurement of UUV systems. Focus on US, Russian and European R&D and procurement programs. Market Dynamics: An insight on the latest technological developments in the UUV market and which countries are changing their preferences, are in position to absorb the new technology and adapt their modus operandi. Roles for all types: Insight on how UUV systems can fit in a military or security concept of operations and how they form a revolution in military affairs. Main military UUV technology trends. Market Trends: Drivers, Inhibitors and Porter’s 5 Segment Analysis and recommendations for the companies that want to stay ahead of the competition. Africa Military UAV Market Revenue and/or Volume. Unmanned Underwater Vehicles for Defense and Security. Unmanned Underwater Vehicles as part of integrated UMV systems. 9.2.5 Future Defense Market: What Lies Ahead? 9.2.6 The New Defense Procurement Fiscal Context of Europe and of the U.S.